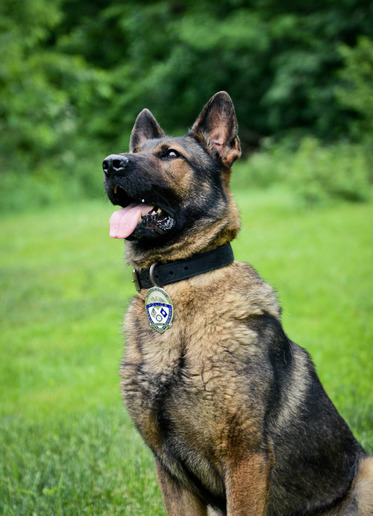 A K-9 with the Nicholasville (KY) Police Department died Friday from a sudden illness, the agency announced on Facebook. Image courtesy of Nicholasville PD / Facebook. Benton—a six-year-old German Shepherd—was named after a former NPD officer, Brett Benton, who had been killed in Afghanistan. "It is with heavy hearts that we share the news that K-9 Benton has succumbed to a sudden illness. He has been part of our NPD family since 2014 and had been on the front lines of trying to rid our community of deadly illegal narcotics," the agency said. The department called Benton a model employee who always came to work eager to do his part. He'd been with the department since 2014 and was the department's only K-9. "Rest in peace, K-9 Benton," the post said. "You will be sorely missed."